The Daily Struggles of the Domestic Un-Goddess: and last but not least…. The main course! This is the final installment in the ‘birthday dinner for two’ series! As mentioned previously, hubs and I couldn’t decide what we wanted for dinner……beef or fish? After a little banter back and forth (the problem was that we both wanted both……) we decided to just get both. :) Easy-peasy. 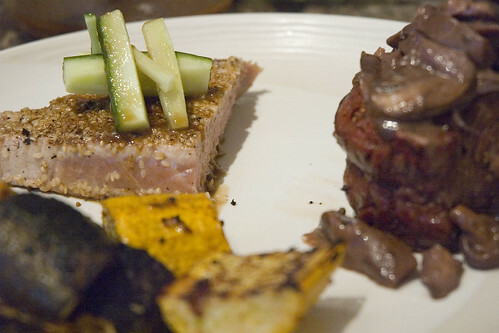 Both tuna and fillet mignon are such that not a lot needs to be done. You don’t need a lot of fancy sauce, or complex marinades to get the best out of these ingredients. In keeping with our theme of simplicity, I opted to buy the best quality ingredients I could, and just let them speak for themselves. And they did. It was fantabulous. 1. Sprinkle steak spice on fillet. 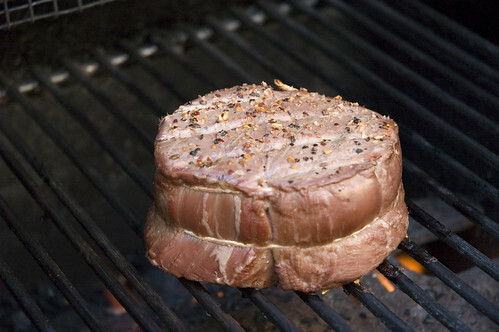 Grill fillet to desired doneness (ours took a heck of a long time……..). Do not overcook it as it will become very tough. 2. Meanwhile, head olive oil in a small skillet over medium heat. Add garlic and mushrooms. 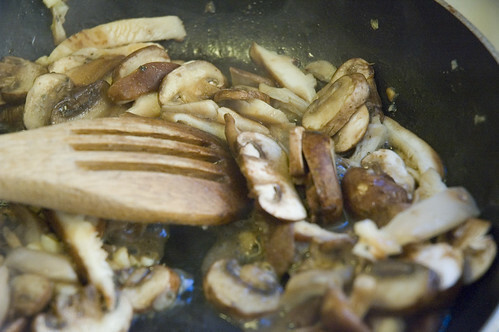 Let mushrooms cook about 7 minutes, until they are almost finished releasing their juices. 3. Add wine and broth. Allow to simmer until almost evaporated. 4. Stir in cream and truffle oil (you could use whipping cream, but I’m trying to be healthy……)…. 5. 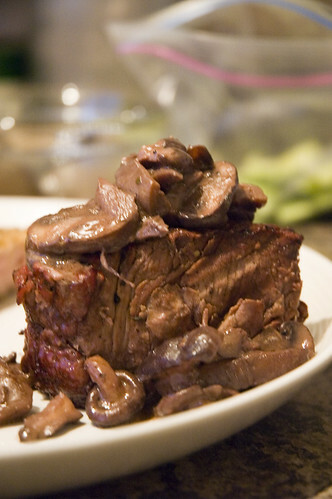 Top fillet mignon with mushrooms. YUM. 1. Combine wasabi powder with water until well blended. 2. 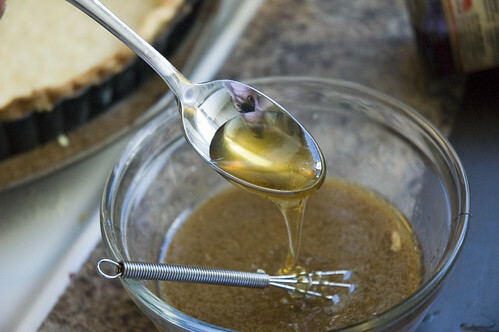 Whisk in sesame oil, canola oil, honey, ginger and soy sauce. 3. 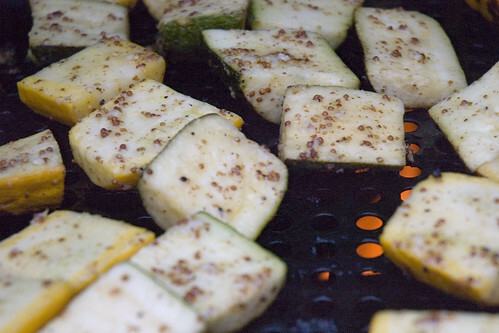 Preheat a grill pan to medium-high heat. Oil the pan. 4. 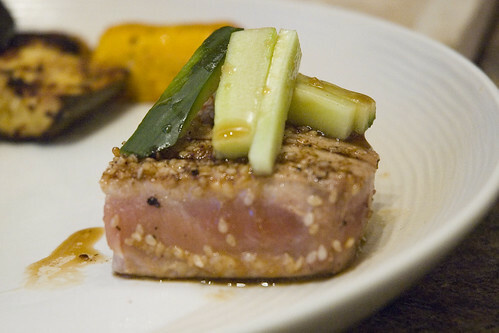 Cover one side of tuna with sesame seeds. 5. 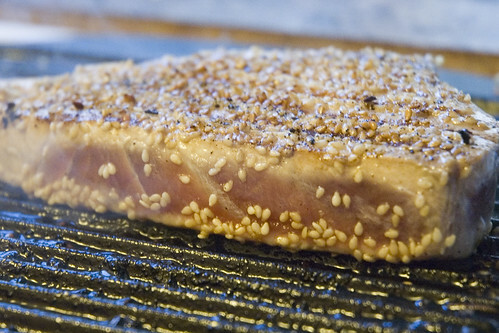 Place tuna on grill pan, sesame side down. Sprinkle seeds on top of the tuna. 6. After 4-5 minutes, flip tuna. 7. 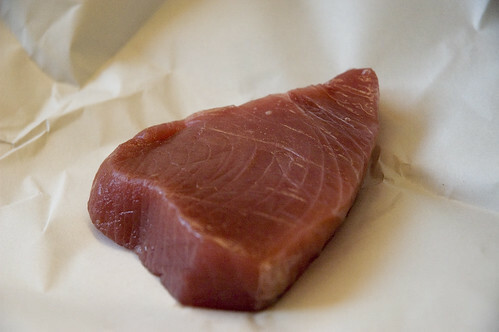 Tuna should be left medium-rare to get maximum flavour. Mine ended up a little more well-done than that as I was trying to keep it warm while the tenderloin cooked! 1. 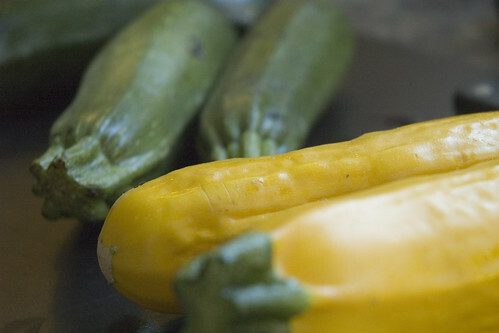 Wash and cut zucchini and summer squash into large chunks. This is such a smokey and summery dish. It’s fantastic. Easy, quick and doesn’t heat up your house. Overall, both of us stuffed ourselves silly with this. It’s delicious, relatively quick and oh so tasty. I think everyone should treat themselves to a split entrée once in a while! I am so going to your house for dinner!